Tripods are for landscape photographers using DSLR cameras, right? They sure are, but just consider how many of your travel photos are blurred. All those delicious sunsets and sunrises you saw, and those videos you took – all blurred, indistinct and terrible. Only a tripod gets you maximum resolution. Considering the high resolution cameras now on the iPhone, the Kenu Stance makes a lot of sense for those after a steady shot. However, most tripods for phones are either on the end of a selfie stick or screw-in to a custom-fit case that otherwise has little appeal. The Stance is basically a tiny three-pronged and very flexible 34g device that unfurls into a reasonably stable rig to support an iPhone. It plugs into the Apple Lightning charge/sync slot, and is best used in low-light. When using the Stance there’s a very good chance that actually pressing the shutter button on the screen will introduce a big wobble to the Stance (and so a blur), so make sure the iPhone’s camera app is set-up to use a two or ten-second delay (the latter would be best if you’ve the patience). Aside from the wobble, our only criticism is that the Stance is not great for landscape photos. While it props-up an iPhone in portrait mode perfectly well (though exact adjustments are tricky since the tiny ball-head is a tad sticky), landscape mode involves closing-up the Stance’s legs and using it as a one-sided prop. For a flat surface that’s fine, but it’s not as versatile as the three-pronged set-up. Despite these drawbacks and the fact that the Stance is only a semi-serious tripod (after al, it doesn’t hold an iPhone dead still), there’s no reason for leaving the Stance at home. 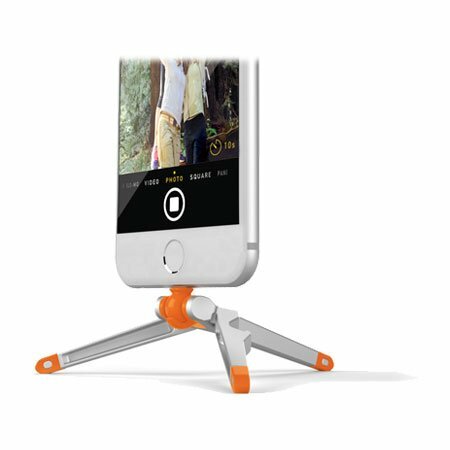 Easily portable and perfect for taking more stable videos, Periscope broadcasts, all kinds of pictures and both sunsets and sunrises (and anything else where light is low), the Kenu Stance is a top-pocket essential for iPhoneography on the go. If you still need convincing?, check-out the notch on the Stance’s left leg; there hides a bottle opener! We’ll drink to that.